Remanufactured Kubota tractors at Farm Fantastic, Caboulture QLD. Our experience at field days around Australia is that many people think our remanufactured Kubotas are in fact, new. They are not new tractors but Kubota tractors that have been rebuilt to a fixed specification. SOTA has sold thousands of remanufactured Kubota tractors to customers, in every State of Australia. We continue to sell them because the are great little tractors and our customers love them, especially with a front end loader and four in one bucket (4-in-1). 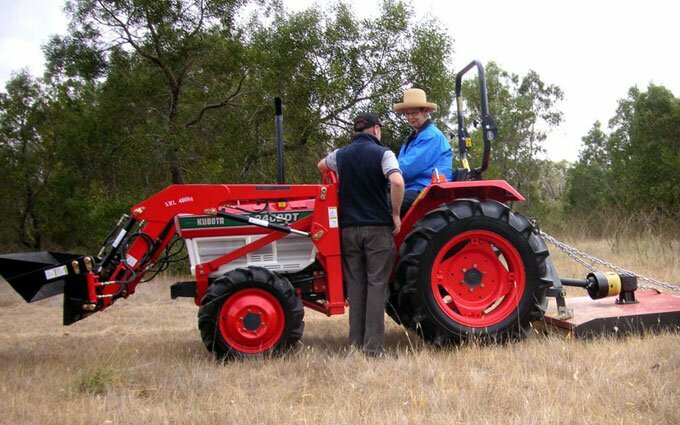 In 2004, SOTA was the first company in Australia to import its entire tractor range with 4-in-1 buckets as a standard feature. In 2006, we also began retailing retrofit 4-in-1 loader kits for imported Japanese tractors. 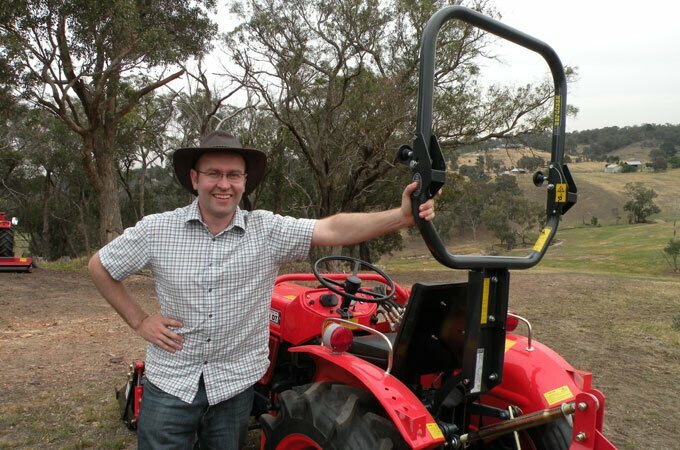 There is a plethora of Japanese tractor brands and models that are available for importation into Australia. Over the years, many unsupported Japanese tractor brands and models have been imported and those unfortunate customers have been left high and dry when they needed spare parts. We know this because these deserted customers inevitably come to SOTA for help. Many of these unsupported tractors do not comply with Australian standards. Some have been sold ostensibly, illegally, not having being fitted with a certified Roll Over Protection Structure (ROPS). All SOTA Kubotas are sold with a certified Hercules ROPS and a certified seat belt. A SOTA remanufactured Kubota is “the” hobby farm specialist because it is a fully supported, Japanese, quality tractor and implement package that won’t break the bank. > Click here to see this month’s SOTA Kubota tractor and implement package deals. SOTA’s commitment to deliver, warrant, service and repair your tractor. Providng a customer with instruction for her Kubota L2402DT with FEL and slasher. The level of detail is such that the cost of refurbishment would be prohibitive if the work were done in Australia. SOTA remanufactures its range in Asia, to take advantage of the competitive labour costs. From the outset a SOTA remanufactured Kubota tractor is dismantled down to the transmission and key components of the engine, brakes and running gear etc. are replaced as required. The tractor is then rebuilt. This is a major point of differentiation and provides customers with far greater confidence than if they were to buy an “as is” or a repaired product in which worn components may or may not be replaced on a discretionary basis. Front End Loader New Front end loader with four in one bucket – ISO 14397-1-2002 compliant. Motor Sleeves, pistons, rings, big-end and main bearings, valves, hoses, seals and gaskets are checked and replaced as required. Oil pumps tested and calibrated for pressure and flow. Roll Bar (ROPS) New – Folding Hercules ROPS Compliant: AS 1636; ISO 5700. Costing significantly less than the price of a new Kubota tractor, a SOTA Kubota is an excellent solution for those seeking a high quality, compact tractor at a very reasonable price. A SOTA Kubota tractor and 4 in one loader is built to a fixed specification to provide a superior product. It is a broadly held view that Kubota makes the best compact tractors in the world. The Kubota Corporation can lay a legitimate claim to “inventing” the compact tractor. Historically, people in Australia have used the phrase “a Kubota”, as a generic term for a compact tractor. SOTA Tractors has no commercial connection with the Kubota Corporation. SOTA sells used, Japanese domestic Kubotas, which have typically done less than 1000 hours work. SOTA Tractors fully supports all the tractors it imports. All Kubota tractors come out of Japan. The Australian and Japanese domestic specifications can differ but often engines and many other parts are interchangeable. SOTA Tractors guarantees spare parts availability for its Kubota tractors. We have several suppliers, including OEM & non-OEM. We have thousands of spare parts on the shelf for Kubota tractors. Kubota Models Info & Specs.